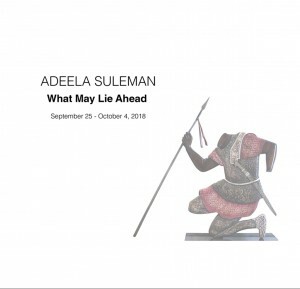 Each time I see a new exhibition of Adeela Suleman’s work I recall a joke she once made about teaching students how to never become “stuck” in their practices. Students would, so her suggestion went, work for an extended period of time on a single artwork and then destroy it, thus learning to embrace the transience of their work and develop the strength to handle the upsets of an artistic career. Her own crash course in knowing how to “let go” came in 2002, when her first major work, ‘Salma, Sitara and Sisters – Motorcycle Workshop,’ a large installation made in collaboration with vesper painters and motorcycle technicians, was lost on its way back from the Second Fukoka Triennale. Miscommunication and tax issues led to the work being stuck at Karachi Port where it was eventually lost. At Suleman’s solo exhibition at Canvas Gallery, techniques and forms that have been visible in her practice for a number of years have been let go or thoroughly revised, demonstrating once again Suleman’s ability to challenge her own practice. This movement between forms and techniques isn’t simply a test of Suleman’s courage and curiosity, but that of her entire studio that includes painters, carvers, metal workers and assistants. One gets the sense, following her work, of a karkhana or atelier of makers collectively asking “how can we enhance this?”, “how can we take this to all the way there?”, “how does what I am good at, and you are good at, and she is good at, produce a thing that is good?” Thus, of a collective creative organism that trusts its Director/Ustad and is curious and passionate about where she can take them all together. The studio is evolving. 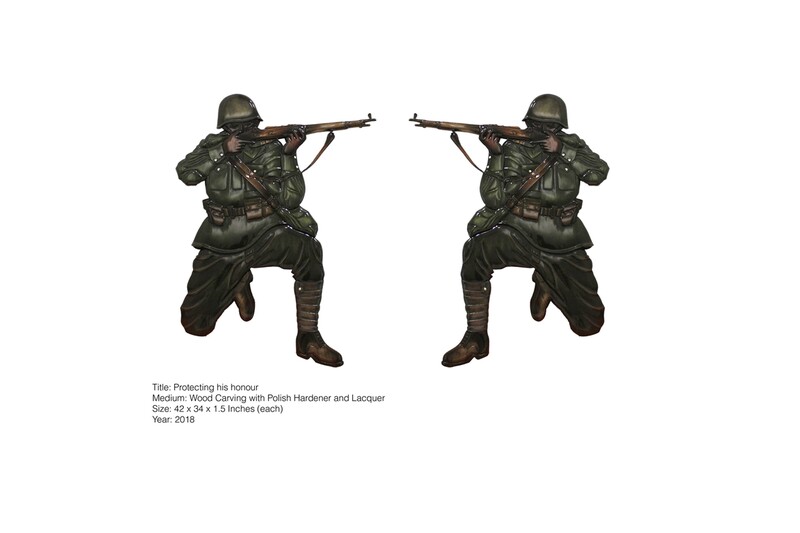 Take for example the series ‘Strike for him when he cannot himself,’ for example, a carved array of standing sculptures representing soldiers of yesteryear, composite forms sourced from pan-Asian miniature painting traditions. 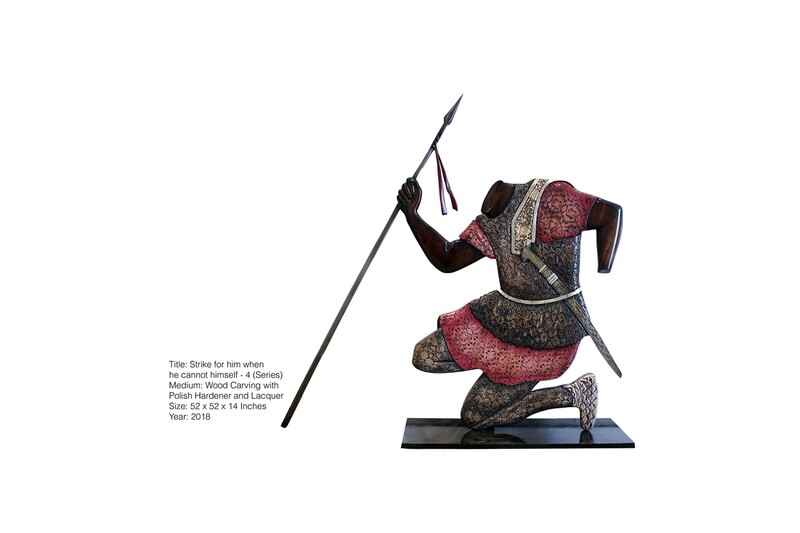 In these sculptures, Suleman has transformed her steel repoussé figures into wood, connecting these new works in turn to the baroque frames that have been surrounding the paintings, painted plates and shells coming from her studio since 2014. Beaten steel has, at least for this exhibition departed, so that wood can come center stage. The frames have become the sculptures. Painting has not disappeared, however. The natural landscape and the traumas we act upon it and within it play out in the three pictorial works in the exhibition. 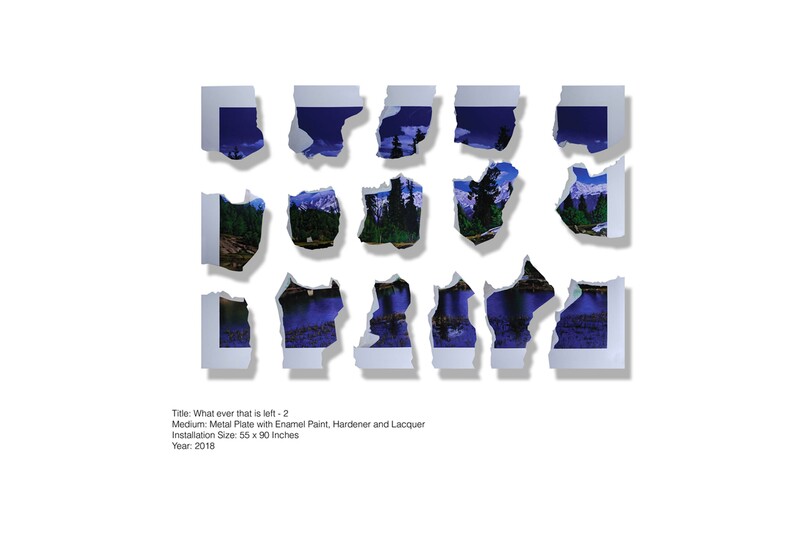 ‘What ever that is left, 2’ is a torn-up postcard representing a majestically blue mountainous landscape blown up in scale and painted onto sheets of steel, arrayed across the wall as a work that is part sculpture, part painting. 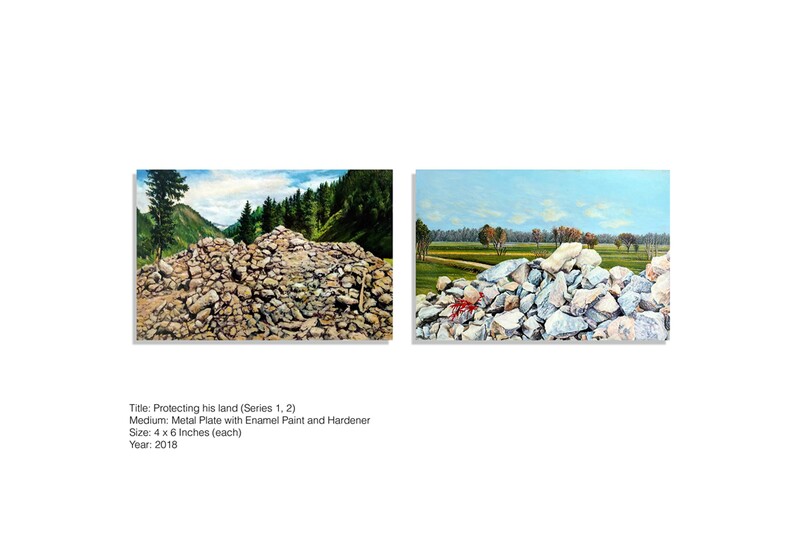 ‘Protecting his land’ are two postcard sized paintings, just 15cm long, representing one mountainous and one flat landscape, both lusciously green but barricaded by rough piles of rocks and boulders in the foreground. Both are hung low on the wall in the gallery, like barely-there punctures in the more spectacular array of sculptures in the exhibition. These landscapes localize the exhibition to the porous and fractious border between Pakistan and Afghanistan. Yet at the same time, they maintain a satisfying generality given that snowy mountain tops and green fields are present on all continents. 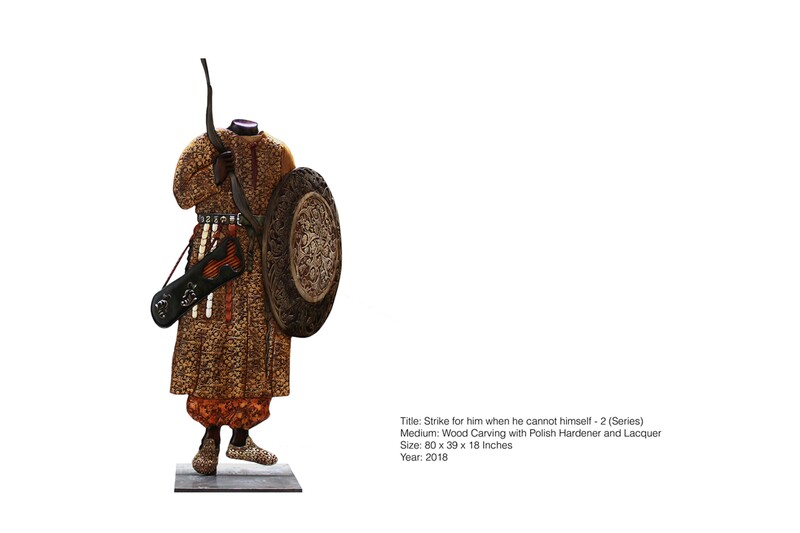 Suleman’s carved warriors in the exhibition similarly move between specificity and globality. Elite scimitar and spear-wielding warriors, soldiers that appear like World War II fighters and others like NATO troops are united by their fear, their lethal masculinity and their co-option, absorbed into history not as individuals but as mere bodies, uniformed beautifully, but still uniformed. 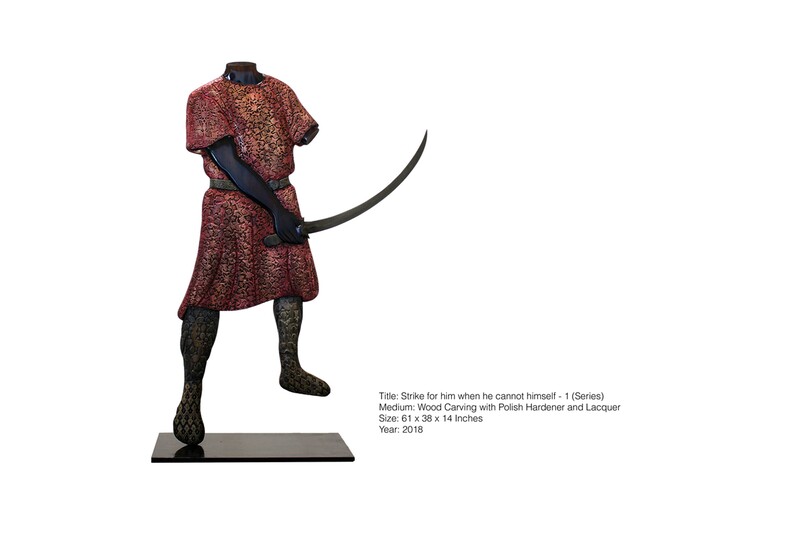 “Who is fighting whom, and for god’s sake, why?” are questions that haunt Suleman’s practice and this exhibition. Headless soldiers speak in particular to this fact of headless conflict, and thus of how conflicts rolls into corruption and constancy. Sumptuous, ornamented and tactile, Suleman’s sculptures and paintings of art compel viewers towards them. But they rarely let us in. Their deliberately ambiguous authorship, emerging from the collectivity of her studio, and the polished surfaces of these works stop the viewer short at the point of absorption. Suleman’s steel and repoussé sculptures had a similar impact: their reflectiveness literally demonstrated to the viewer their distance from the work, emotional and spatial. Even when Suleman works with painting, the opaque enamel paint her collaborators use, the surface sheen of the image, and the way that her paintings are less windows into a scene than objects, works of sculpture, continually works to push the viewer away from the image. A trite analysis of this push-pull between attraction and resistance when viewing Suleman’s work would be that it replicates the spectacularizing of conflict, the aestheticizing of politics, and our inurement to other people’s pain thanks to media, Hollywood, and the rest. That’s there, of course. Suleman has talked in the past about her work having a Quentin Tarantino-esque sheen. That allows you to look at violence and be gripped and yet not frightened. To be compelled but feel thoroughly unemotional. But on the other hand, the depersonalized aesthetics of Suleman’s sculpture also inhibits the viewer from indulging in sentimentality or liberal self-righteousness. This work doesn’t let us feel good about feeling bad. Sharply unromantic, Suleman produces works of beauty that are literally repulsive. And dreams of heroism but without reliable heroes. Thoroughly indifferent, Suleman’s combatants wouldn’t care if we wanted to empathize with them anyway. Our feelings are irrelevant. And that’s the point. All these interminable bodies are just doing what they think is right. They’re doing their jobs. As they have for centuries. How horrifying. How fascinating.